With confirmation of the first case of Chronic Wasting Disease (CWD) in west-central Mississippi, the Alabama Department of Conservation and Natural Resources (ADCNR) and the Alabama Department of Agriculture and Industries have quickly responded to the news. ADCNR’s Wildlife and Freshwater Fisheries (WFF) Division added Mississippi to the list of states where the importation of body parts from members of the cervid family – white-tailed and mule deer, elk and moose, etc. – is prohibited unless the meat is deboned and other regulations followed. “We’ve been warning about this for years, that this was not something that was fabricated, and we needed to do everything in our power to keep it out of Alabama,” said WFF Director Chuck Sykes. “Now it’s hit home. It’s real close now. What it means is we, as an agency, can only do so much. We can set regulations. It’s up to the hunters to fulfill those regulations. That’s why we’ve made a big media push to get the word out. 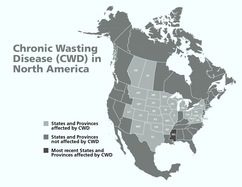 Currently, 25 states and two Canadian provinces have confirmed cases of CWD. Any member of the cervid family harvested in those CWD-positive areas must be properly prepared before it can be legally brought into Alabama. Parts that may be legally imported include completely deboned meat, cleaned skull plates with attached antlers with no visible brain or spinal cord tissue present, upper canine teeth with no root structure or other soft tissue present and finished taxidermy products or tanned hides. CWD is a transmissible spongiform encephalopathy found to affect deer and other cervids. It is believed to be caused by an infectious prion and has an extended incubation period. Diagnosis requires examination of brain and lymphatic tissue. Infected deer become emaciated, behave erratically and eventually die. Sykes said the public’s participation is needed because of the limited number of conservation enforcement officers throughout the state. “People have got to start reporting what they see if they see someone doing something wrong,” he said. “We’ve only got so many officers in the field. We cannot be everywhere. Alabama Department of Agriculture and Industries Commissioner John McMillan and ADCNR Commissioner Chris Blankenship announced this week that new testing equipment has been purchased by the ADCNR’s Wildlife and Freshwater Fisheries Division for the State Veterinary Diagnostic Laboratory. The equipment, known as Enzyme Linked Immunosorbent Assay (ELISA), will be dedicated to testing samples for CWD. Agriculture and Industries will employ a technician to conduct the tests. The testing equipment is undergoing a validation process required by the United States Department of Agriculture’s National Veterinary Services Laboratory. Once complete, the laboratory will be able to test deer samples and quickly determine the presence of CWD. The good news is there is no scientific evidence of any transmission of CWD to domestic livestock or humans. Alabama’s economy and way of life, as mentioned by Sykes, are at the top of the list of concerns for Kevin McKinstry of the Westervelt Corporation, a timber company that has been in the hunting and hunting land-leasing business for many decades. McKinstry has been studying the effect of CWD contamination for several years, but no direct correlations can be drawn to Alabama and other states in the South. The economic impact of deer hunting in Alabama is more than $1 billion. “There certainly is the threat of economic devastation with CWD, but in those areas with contaminated deer, there really hasn’t been a lot of hunting business or land-leasing,” McKinstry said. “We don’t have any hard case studies. This area in Mississippi (Issaquena County, bordering the Mississippi River just north of Vicksburg) does have a lot of hunting activity, so this could be the first real illustration of what the impact might be. As important as the white-tailed deer is as an economic driver, this could be something that could dissuade people from buying licenses or leasing hunting land to hunt deer. From a business standpoint, however, McKinstry has not been able to find a model in the states affected by CWD that would compare to the Southeast. “I’ve been working on this for the past three or four years,” he said. “I’ve not been able to come up with a similar business model in the Southeast with large landowners with recreation leases or commercial hunting lodges. Leasing land is a pretty new concept for up North and the Midwest. This case in Mississippi will probably give us a case study to look at and measure the economic impact. Chris Cook, Deer Project Program Leader, said the WFF’s updated CWD action plan makes it more user friendly so the public can understand what will happen if CWD is ever confirmed in Alabama. In states with confirmed cases, a containment zone, usually a 5-mile radius, is established. The deer density is then established and a specific number of samples is taken for testing. If more positives are confirmed, the containment zone is expanded until officials can determine the distribution of the disease. Cook has been in touch with the Mississippi Wildlife, Fisheries and Parks to get information on the positive CWD deer. “It was on a hunting club,” Cook said. “They had seen the deer for three days. One of the hunters was on a food plot. He watched the deer come in, and it was staggering around. It fell down and died while the hunter was there. They contacted the wildlife department, and unfortunately it tested positive. Dr. John Fischer, professor at the University of Georgia’s School of Veterinary Medicine, is at the forefront of CWD research and said Mississippi wildlife officials will be hard-pressed to discover the source of the infection. Fischer said one of the daunting characteristics of CWD is the prion (an abnormal protein) that causes the disease is virtually impossible to eliminate. Fischer said Alabama appears to be responding to the threat in the best way possible. “All you can do is do the best you can to prevent the introduction of the disease into the state,” he said. “Early detection is going to give you a better success of managing the disease. In areas where the disease appears endemic, the primary goal is to slow down geographic spread. Eradication doesn’t appear reasonable at this stage. The only instance I can think of, in New York, they had two cases in the wild in 2005 and haven’t had any since. Westervelt’s McKinstry reminds us that we are all stakeholders in having a viable white-tailed deer resource in the United States. Mississippi is the latest to be added to the states where CWD has been confirmed.